Home to nearly half a million people, Honolulu is Hawaii's state capital and only major city. The city of Honolulu and the island of Oahu offer a wealth of historic, cultural and scenic attractions. Waikiki Beach and Diamond Head are two of the city's enduring symbols. Pearl Harbor, site of the USS Arizona Memorial and the "Punchbowl," are haunting reminders of the tragic events of December 7, 1941, when the Japanese surprise attack on Pearl Harbor forced America into World War II. Honolulu is also home to the historic Iolani Palace, the official residence of Hawaii's last royals. Beyond the city lie tropical rain forests, the Pali Lookout and the North Shore known for its surfing beaches. A draw card to visitors of all ages, from all corners of the globe, Honolulu's appeal ranges from it's magnificent beaches, countless well-stocked shops, tempting restaurants and a multitude of historic, cultural and scenic attractions. 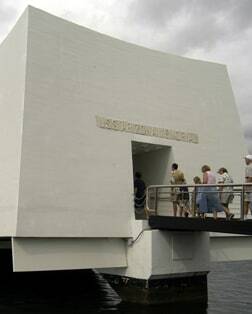 A top tourist destination in Hawaii, this historic harbor features a memorial to the sunken USS Arizona and the 1,177crewmen who lost their lives during the Japanese attack on December 7, 1941. Located on Oahu's North Shore this entertaining and educational center offers activities such as games crafts, music and dining, that will immerse you in Polynesian culture, arts and customs. A perennial favorite stop among visitors to Oahu, this breathtaking lookout features strong winds, 985-foot cliffs and panoramic views of the windward side of the island. Located on the Southeast coast of Oahu, this world-famous volcanic crater was given its name by British sailors in the 1800s who mistook the glittering calcite crystals in the lava rocks for diamonds. Immerse yourself in Hawaii's royal heritage at this beautifully-restored palace built in 1882 by King Kalākaua, remembered as "the Merrie Monarch" because of his art patronage and penchant for socializing and entertaining. Built in 1847, this beautifully-preserved, Hawaiian-Victorian summer retreat of Queen Emma, wife of King Kamehameha IV, features exhibits and tours that offer a glimpse into the lifestyle of the Hawaiian monarchy. This curved bay formed from a volcano crater features a pristine white beach, hiking trails with breathtaking lookouts and a stunning coral reef that is home to a rich diversity of marine life. While it features calm waters in the summer, during winter months this bay offers up some of the largest and spectacular surf in the world, thus making it a popular site for surfing contests.